« RALEIGH, NORTH CAROLINA to install plug-in hybrid charging stations…. 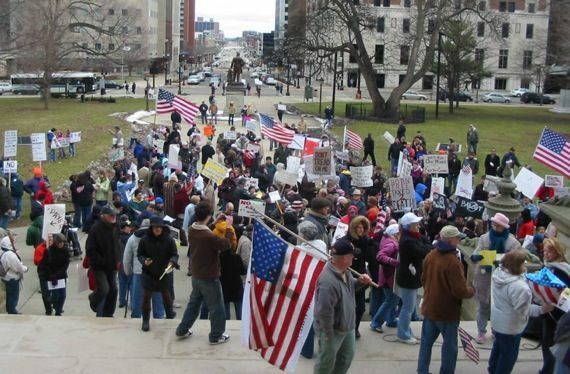 TEA PARTY UPDATE: photos and Fox TV video from Chicago. 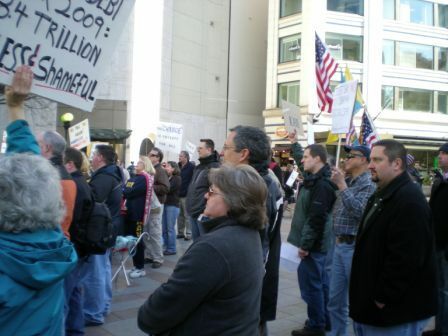 Plus, a report from Seattle, courtesy of Sherri Kennamer, who writes: “I attended the Tea Party in Seattle this afternoon. The crowd was three hundred or so.” Here’s a pic she sent. 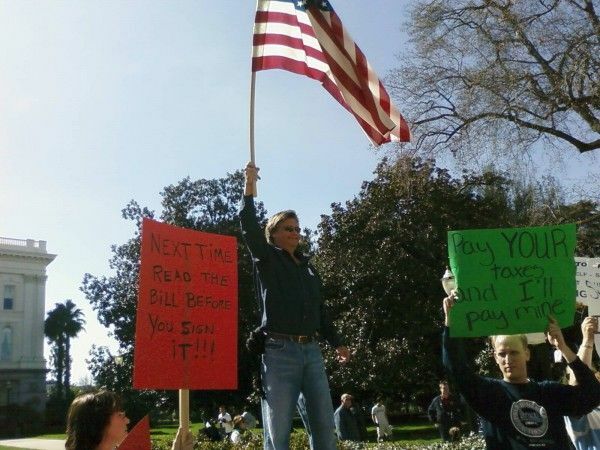 Plus, St. Louis Arch Tea Party Draws 1,500 Protesters! Lots of pictures at the link, as well as links to reports on other protests around the country. Several thousand neopatriots – some shouting “Give me liberty or give me death!” – took to the streets in over 30 US cities Friday, representing what some of them call the beginning of a new conservative counterculture in America. “The spark has been lit,” says Ben Mihalski, a “house husband” from Cobb County, Ga., one of at least 300 protesters who gathered in a hefty downpour outside the Georgia Capitol on Friday to protest what they see as profligate spending by Washington. 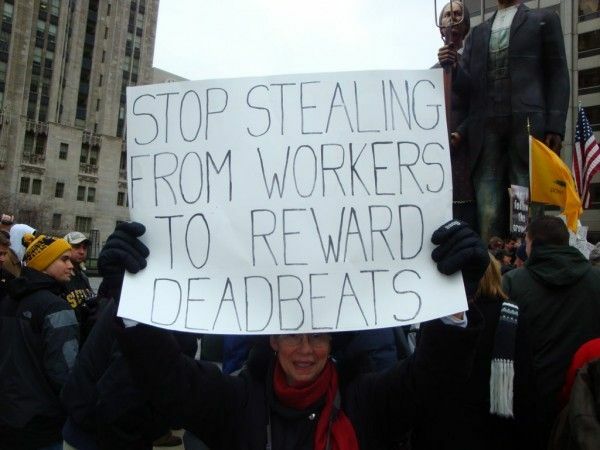 Protesters with sign-slogans like “Pillage and plunder: At least the Vikings did it openly” fanned out across capitols and courthouses in cities from Nashville, Tenn., to Los Angeles, objecting to bailouts and policy changes since the inauguration of President Obama. The Tea Party USA movement also added some symbolic flourish, vowing to gather tens of thousands of tea bags to be dumped on the floor of the US Congress. In Atlanta, the brand was Luzianne. And, courtesy of A.C. Kleinheider, a Nashville Post report, with video, on the Nashville protest. UPDATE: Dave Weigel reports from the White House protest. 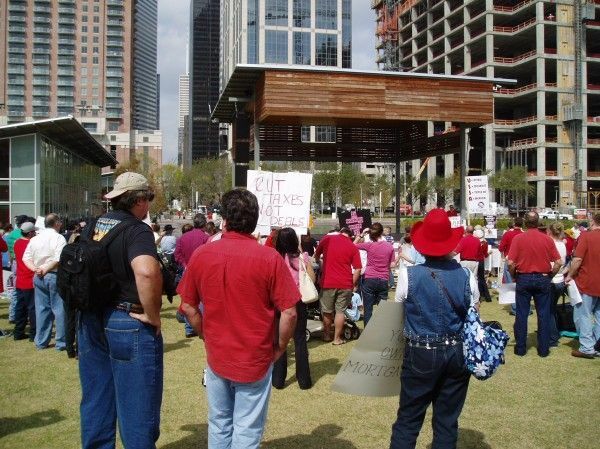 And reader Jerry Dickerson sends this from Houston: “This picture was taken at the Houston Texas Tea Party at Discovery Green. At 12:30 there were approx 250-300 attendees, pretty good turn-out considering the livestock show barbeque cook-off in Reliant Park was a competitor.” Turning out against pork vs. turning out for pork. Hmm. Tough call. 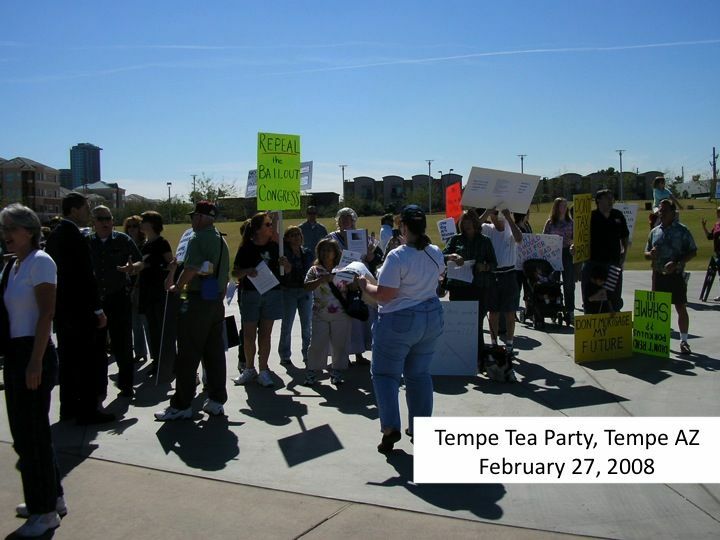 We had approximately 150- 200 people at noon at the Tempe Town Lake Tea Party. Tom Jenny, the Arizona Director of Americans for Prosperity, was in charge. They had several state legislators who talked and then invited people in the crowd to speak as well. Here are a few shots from today, use any and all if you like. Hopefully the next one will inspire more to turn out and hopefully they will have a bull horn or microphone so it would be easier to hear. Yes, the folks doing these are inexperienced at the moment. That’ll change. Here’s a picture from Tempe, where the weather was better than many locations today! The weather was a lot worse in Lansing, Michigan. Reader Duane Hershberger reports: “Some pictures from Lansing, Michigan. My guess is 120 people showed up in 30 degree weather with 4 days notice. Freezing rain was predicted, but did not materialize. Actually, just as we were starting the sun came for 5 minutes.” Not quite Tempe, but extra points for hardiness! Here’s a pic. Brr! And here’s a report with more photos from Lansing. Also, here are some more pictures from Denver. STILL MORE: Some more Chicago reporting, from Freedom Folks. Megan Fox was there, too, and posted a report with lots more pictures.